For this year’s Spanish specialist bird tour, we have chosen to move north to Catalunya to target two of the most charismatic species in Europe – Lammergeier and Great Bustard. The tour starts in the province of Huesca where we shall concentrate our efforts on the magnificent Lammergeier. In doing so, we shall be able to focus upon a range of other raptors that should include Egyptian and Griffon Vultures and Red and Black Kites and possibly even Black Vulture. Common Raven and Little Owl can also be expected. After two days with the raptors, we have a day’s travel to the province of Zamora where the rolling steppe is the land of the Great Bustard, the world’s heaviest flying bird. 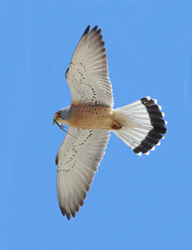 Early success will provide an opportunity to photograph Lesser Kestrel at a breeding colony and a range of small passerines at a feeding station. This tour is designed for specialist bird photographers and utilises a series of commercial hides (baited with dead rabbits for the raptors) carefully chosen to maximise opportunities to photograph at close range. Most ‘all-day’ hides comfortably hold at least four photographers. Photo distances range from very close to 40+ metres making a 300 mm fixed, or a 400 mm zoom, with converters, the appropriate lenses. 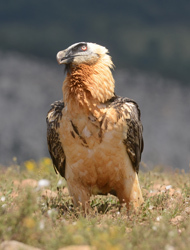 The Lammergeier and Great Bustard hides require photographers to remain in the hides for the whole day (up to ten hours) as it is essential as little human disturbance occurs as possible. This tour provides an unrivalled opportunity to photograph two species that can rarely be approached ‘in the field’, along with a supporting cast of species that are almost equally exciting. Day 1: Morning flight to Barcelona and transfer to Huesco province, a drive of approximately 3 1/2 hours. Day 2: is a full-day session in the Lammergeier hide where, in addition to Lammergeier, there will be other raptor species such as Griffon Vulture and Red and Black Kites. Day 3: In the morning we shall concentrate upon Egyptian Vulture from a hide that is not infrequently also visited by Black Vultures. In the afternoon we move to Montgai where, among other possibilities, Little Owl is a regular subject. Day 4: An all-day drive to Zamora Province. Days 5 & 6: Two days are set aside to give us the greatest chance of photographing Great Bustards. Day 7: Photography at a Lesser Kestrel colony in the morning and at a feeding station for passerines such as Iberian Magpie, Subalpine Warbler, Black Redstart and Rock Sparrow in the afternoon. Alternatively, there will be another opportunity to try for Great Bustard if we have so far been unsuccessful. Day 8: Transfer to Madrid for return flight to UK. Includes: Economy class return flights (UK-Barcelona-Madrid-UK), accommodation, meals, transportation in Spain, use of specialist photographic hides, Canon telephoto lenses and services of leader.